I have had several skeins of raffia in my supply stash for quite a while. Decided it was time to use at least one of them and find out how it braided up. With any stiff or unknown fiber I like to finish the braid in my circular design. 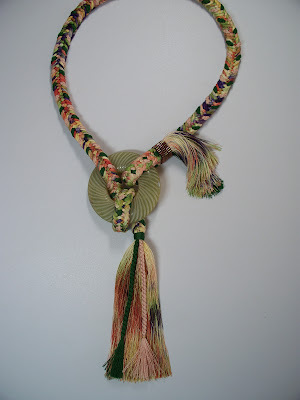 After I’ve finished the braiding, I can determine whether or not the circle will have a tassel (love those guys!). Surprisingly, the raffia ended up with a tassel. 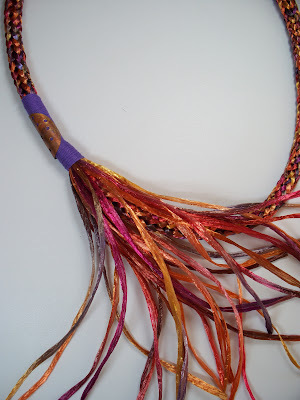 Finished the piece with a purple cotton fiber wrap to set off the small copper embellishment. I like it. Sometimes, however, no matter how many fun and interesting fibers you braid, you always come back to the basics: silk. 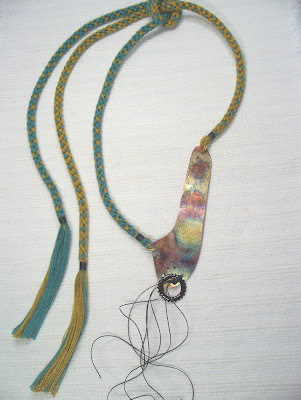 The braid below used both plain and variegated silk. And, wow, what a tassel! I do just love those guys! 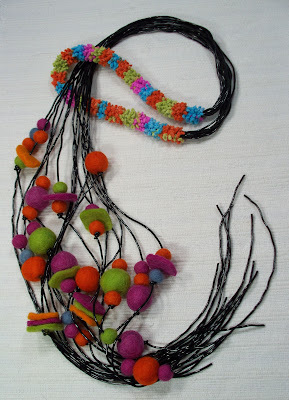 The little braids seen on top of the tassel are actually two of the warps used in making the braid. 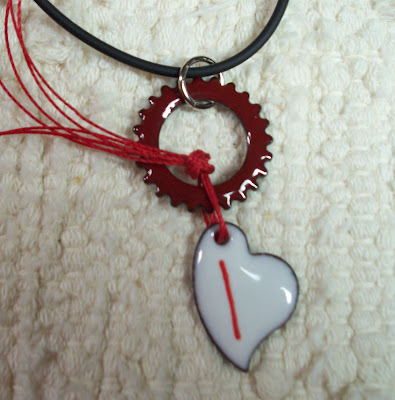 I like this one, too. There are times when you start out to make one thing and it turns into something else entirely. I guess that is what is known as ‘evolutionary design’. I found these gorgeous matte olive green and matte purple beads that I knew would be a stunning brick stitch bangle. The plan was to support the bangle with thick cotton cording. Well a few inches into the bangle and I realized this plan was not valid (there was no bending this piece!). Undefeated, I carried on and stitched a length of beads and filled the bead tube with cotton cording. 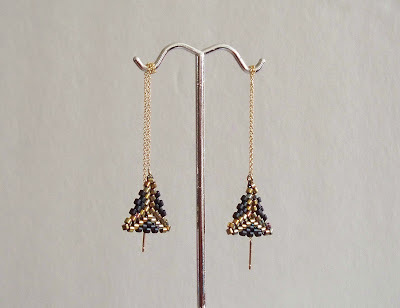 After looking at the bead tube for a while I came to the decision that it could be the center of a neckpiece which would be held up with some wonderful braids made of purple C-Lon. 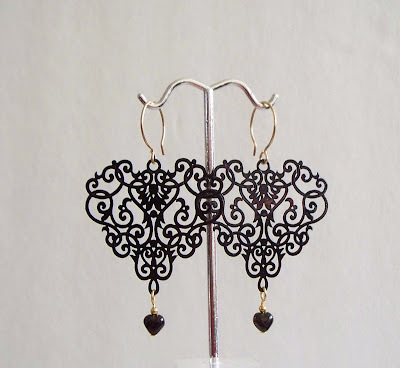 As the C-Lon was also a matte finish, a few metallic strands could be added to the braid warps for a little sparkle. 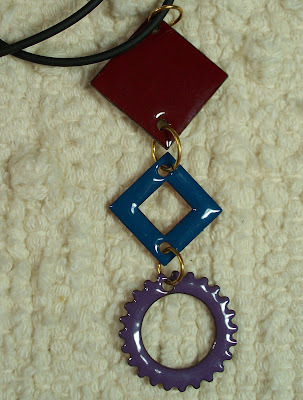 That done, I now had a simple, geometric neckpiece with a bit of sparkle on the sides. Now I needed to balance the side sparkle with something on the bead tube. 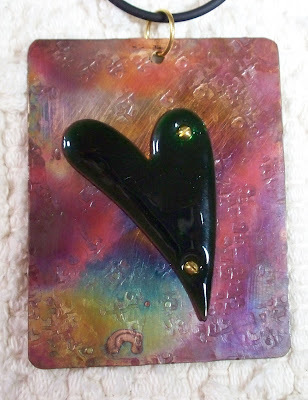 In my metal supplies, I found a wonderful piece of copper. 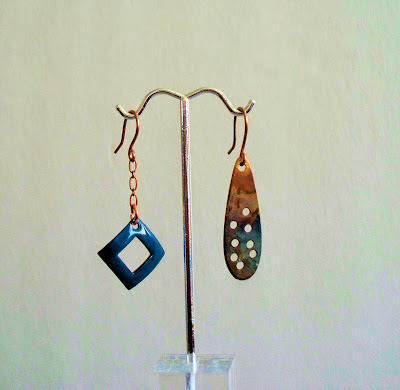 The copper needed a hole and some patina. 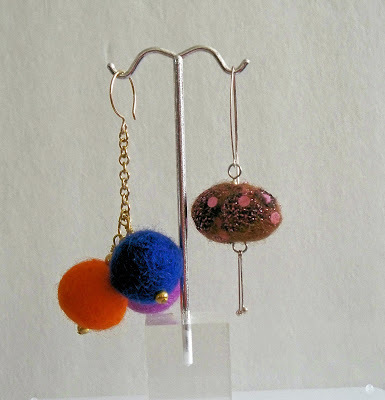 After that was completed, a bail to suspend the copper from the bead tube was required. A small braid to the rescue. So now my bead bangle has become a neckpiece. I’m satisfied. 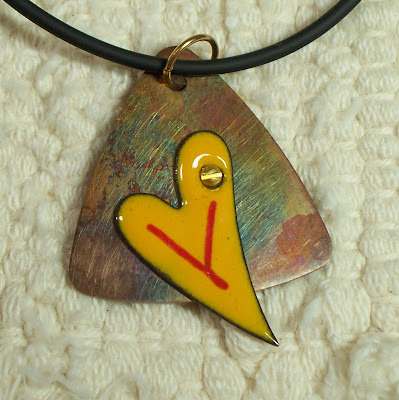 I submitted the following items for consideration in the Interwoven IV: Accessories show being held at 18 Hands Gallery in the Houston Heights. To my surprise all were accepted. Unfortunately, I’ll not be able to go the reception being held on November 3rd. That day falls on the weekend of the International Quilt Festival and I’ll be working there. The gallery show is scheduled to run from November 3, 2012 to November 14, 2012. So I do have time to go and see it. I know several people who will also be showing. Am anxious to see all the work being exhibited. 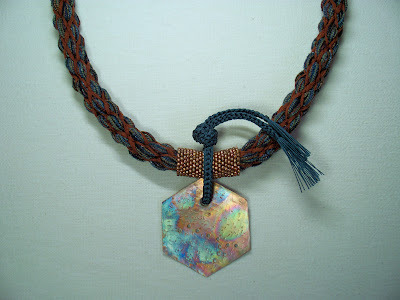 Kumihimo neckpiece made with silk and displaying one of my copper pieces done with a heat patina. 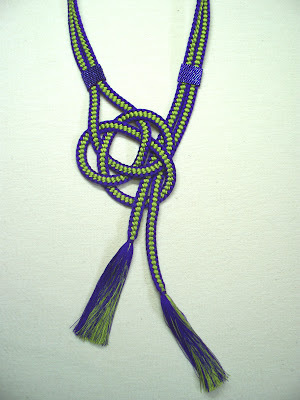 Kumihimo neckpiece made with silk and incoporating the Chinese Coin Knot. 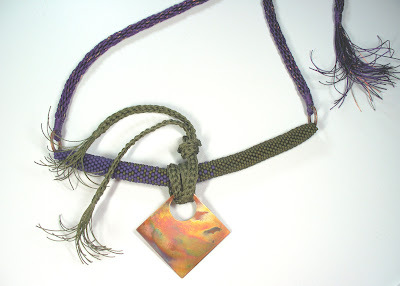 Kumihimo neckpiece made with copper wire. 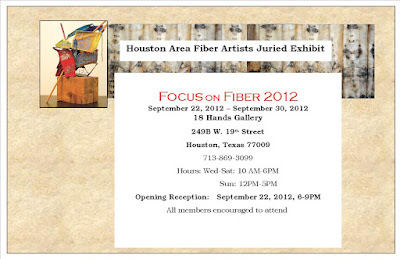 This weekend is the start of the 2012 Gallery Show for the Houston Area Fiber Artist members. It will be held at 18 Hands Gallery in the Heights. Please stop by if you’re in the area. 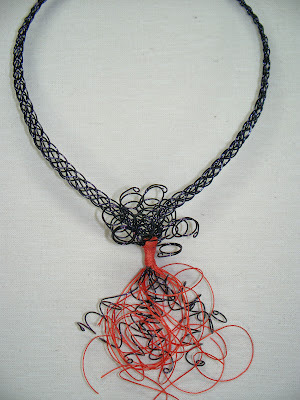 My work is included with some of the outstanding fiber artists in our area. Both pieces in my August 5th post were accepted. I’m very excited.